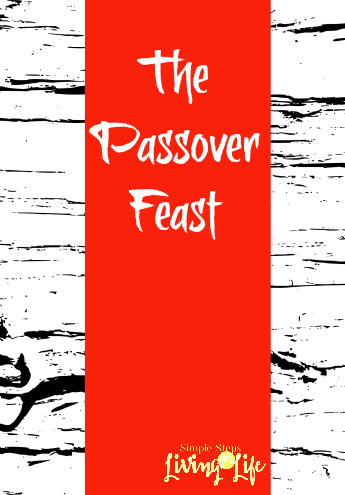 Have you heard of the Jewish celebration of The Passover Feast? It is when Jewish people remember how God brought their people out of slavery in Egypt. The pharaoh at the time was not letting the Jewish people go out into the dessert to hold a 3 festival to God(Exodus 5). I’m guessing because the Jewish people were about 1+million of his slave labor force; but that’s just me guessing. Now Pharaoh was mad and said that the Jewish people were lazy. So he punished them by not supplying them with straw they needed to make bricks. Now the people had to go gather their own straw but still required the same amount of bricks to be made. Ugh. God sent Moses (and also Aaron) back to Pharaoh again to say that God said to let the Jewish people go out of Egypt. And that’s when all the plagues happened. Have you heard of this part? There were a bunch of plagues – water throughout Egypt was turned to blood, frogs everywhere, gnats, flies, all the livestock of the Egyptians died, boils on the men and animals, epic hail storm, locusts eating everything and never before or again was there such a plague of locusts, darkness spread over Egypt that could be felt for 3 days, and the plague on the first born. Before almost every plague, God told Moses to say to Pharaoh, ‘Let my people go, so that they may worship me.” After almost every plague God hardened Pharaoh’s heart and he wouldn’t let the Jewish people go. Almost every plague, but the last one. Here’s where The Passover feast comes into play. The book of Exodus chapters 11 and 12(see below) talk about the plague on the firstborn and The Passover. The night of this plague each Jewish household was to take blood from a lamb and put it on the sides and tops of the doorframes of the houses where they eat the lambs. On that same night God passed through Egypt and stuck down every firstborn – both men and animals. The blood was a sign so when He saw the blood He passed over the people in that house. No destructive plague touched the people when He struck down Egypt. This feast is still celebrated to this day – this year(2017) from April 10-18. As a Christian, for me, the Passover feast is a reminder and a foreshadowing of redemption. It reminds me of the Lamb of God, Jesus, His blood is a covering of my sins. It reminds me that the doorframe of my heart has been covered by His blood so that during God’s judgement I am passed over. I am part of a holy covenant. This sinner. Me. What a blessing to have a reminder from so long ago about what I am afforded today. Praise God for loving this sinner. Praise God for great mercy in the midst of great judgement. Praise Jesus for being the Lamb for the world. 29 At midnight the Lord struck down all the firstborn in Egypt, from the firstborn of Pharaoh, who sat on the throne, to the firstborn of the prisoner, who was in the dungeon, and the firstborn of all the livestockas well. 30 Pharaoh and all his officials and all the Egyptians got up during the night, and there was loud wailing in Egypt, for there was not a house without someone dead. 33 The Egyptians urged the people to hurry and leave the country. “For otherwise,” they said, “we will all die!” 34 So the people took their dough before the yeast was added, and carried it on their shoulders in kneading troughs wrapped in clothing. 35 The Israelites did as Moses instructed and asked the Egyptians for articles of silver and gold and for clothing. 36 The Lord had made the Egyptians favorably disposed toward the people, and they gave them what they asked for; so they plunderedthe Egyptians. “No foreigner may eat it. 44 Any slave you have bought may eat it after you have circumcised him, 45 but a temporary resident or a hired workermay not eat it. Cindy, I love Passover! This year, instead of an Easter Sunday meal, our family held a seder. My daughter in law had never been to one so it was very exciting to be able to host her first! We all love the food (finished up the knadels (matzo balls) today for lunch and Passover and Easter go hand-in-hand. Jesus was the fulfillment of the Passover as the Lamb of God who takes away the sins of the world. Many do not know that the Last Supper was a Passover seder. When you know that, it all takes on another dimension. So cool!